While tense tactical battles and last ditch defending are both admirable let's face it, football is about goals. For those of us that love the beautiful game we'll see hundreds or perhaps thousands, if we have an understanding partner, of goals in our lifetimes, but there will be a select few that will stand out and give you chills when thinking of them, even twenty years after the fact. Prior to the 1995/1996 season, when Alex Ferguson had let several senior players leave Manchester United and he had replaced them with players from the youth ranks many were questioning his judgement. But led by the inspirational Eric Cantona, the "kids" did their part and helped the club to an unexpected league and cup double. In the first match of the following season though, away to Wimbledon, one of these youngster printed his own headline and it wouldn't be the last. 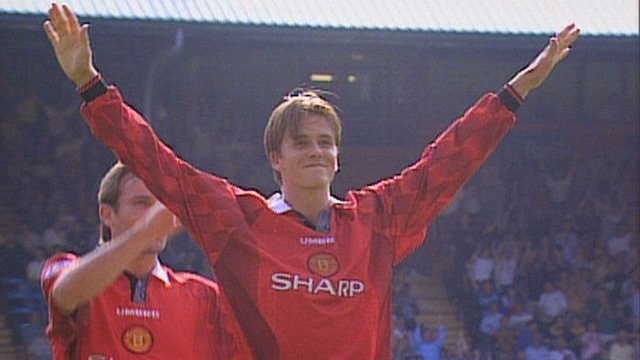 Seeing Wimbledon keeper Neil Sullivan off his line, David Beckham unleashed a drive from his own half that found the net and catapulted him to stardom. In preparation for the World Cup 1998, which they would be hosting the following year, France staged a four team tournament in the summer of 1997 entitled simply 'Le Tournoi'. Including the hosts, the other sides involved were England, Italy and Brazil. The only things many observers recall from that particular friendly tournament is that it was ultimately won by England, playing some very effective football under Glenn Hoddle and a certain goal by Roberto Carlos. The goal, which came virtue of a freekick against France, became a career defining one for the Brazilian leftback. Hit with power towards the French wall, it swerved wildly to the right and then hooked back into the net at the last second. The free kick seemed to ignore the rules of physics and is still the most incredibly struck free kick I've ever seen. Seconds away from finishing the season without securing a Champions League spot, needing to defeat Valencia but only drawing 2-2, Barcelona looked to be out of ideas. Surrounded by defenders on the edge of the Valencia box, Rivaldo received a chipped pass from Frank de Boer on his chest and then somehow managed to hit a sumptuous overhead kick into the bottom corner of the net. This magical strike not only sent his side into the following season's Champions League, but emphasized what a brilliant player the Brazilian was. After a fairly quiet first half, the supremely gifted French playmaker Zinedine Zidane shaped his body back to strike a poorly hit cross from Roberto Carlos. On his so-called weaker left foot, Zidane sent the ball screaming into the Leverkusen goal for what would eventually be the Champions League Final winning goal. It was an incredible pivot and brilliantly struck goal by one of the finest players of my generation. With the Manchester Derby knotted at 1-1 and less the fifteen minutes remaining, it was going to take something extra special to settle things and special is certainly what the Old Trafford faithful got. On 78 minutes, United winger Nani sent in an awkward cross for striker Wayne Rooney, who leaped in the air with his back to goal and fired in a brilliant bicycle kick fit to win any match. 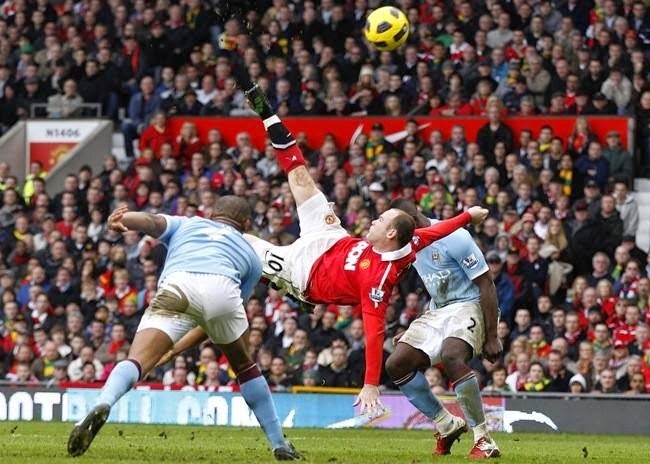 As Rooney raced to the corner and the crowd erupted, his threats to leave United for City only a few months prior to this match were quickly forgotten.